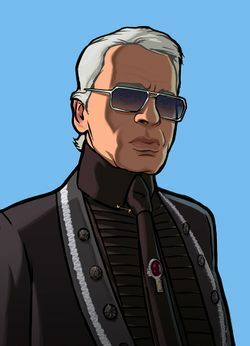 Karl Lagerfeld (born Karl Otto Lagerfeldt; September 10, 1933 – February 19, 2019) was a German fashion designer, and the host of Liberty City's K109 The Studio. Lagerfeld also contributed to the soundtrack of that station by including his favorite dance and electronia tracks. He has collaborated with a variety of different fashion labels, most notably Chanel but also Chloé and Fendi. Furthermore, he owns several labels, which he launched in the early 1980s, in various industries including perfume and clothing. He has also played a role in equipping leading artists. Lagerfeld died on February 19, 2019 following a short illness. This page was last modified on 19 February 2019, at 16:39.